If you jailbreak your i-device and install Cydia Store, or one the other independent iOS software platforms, you get access to apps like Barrel. 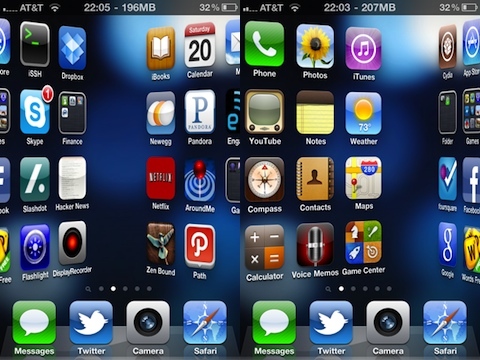 Barrel, which is currently at version 1.5.8-1, is an iOS hack that transforms icon displays, such as the home screen, with graphic effects. The default mode is a 3D-like cube effect, and users can view it internally or externally, which dictates the look and feel of the transformation. Barrel is free and it’s available as an iPad, iPod touch and iPhone app. It requires iOS 4.0+, the newest version added initial iOS 5 support and iOS 3.x support is currently in beta. The biggest issue with 3.x support is the speed of the first-gen devices that use it. Barrel is stabile on them, but the lag reduces the mod to little more than an oddity. Unlike earlier versions of the Barrel app, v1.5.8-1 adds an icon to your home screen. Tap that icon to bring up the application settings. If you prefer not to have that additional icon floating around your icon pages, you can delete it and access the application settings directly the standard way. Once in the settings, you can enable or disable the effect. You can also choose the display mode. The default is Cube (inside) and its alternate is Cube (outside). The other modes include Stairs (down right), Stairs (down left), Vertical Scrolling, Page Fade, Page Zoom, Page Squeeze, Curl and Roll Away, Curl and Roll Away Alternate, Icon Collection, Icon Scatter, Flippy, Pac-Man, Carousel and Merry-Go-Round, which the developer added in this latest version. When it comes to our i-devices, most users have far more than a page’s worth of icons. Managing and navigating through them becomes a hassle. So the goal of the Barrel app is to make swiping through those icon pages a better experience. In its default mode, this is precisely what this mod does. Multiple icon pages actually feel like part of a greater whole. The more we used it, we found we had better recall, and those hard-to-find icons were much less of a problem. We wouldn’t jailbreak our phone and install Cydia Store just for this iPad, iPod touch or iPhone app, but it’s definitely an improvement over the default implementation. With each new version of the hack, the developer has added new modes. We listed a bunch above, and there’s actually more than just those. In our experience, these added modes are a lot less useful than the default 3D cube mode. In fact, we think most of them have the opposite of the intended effect: They’re disorienting, and they end up making icon page navigation an even bigger chore. In its default mode, however, Barrel is a big win and has been since its launch. It’s free, most users will love how it improves the user experience, and they’ll use it all the time. AppSafari review of Barrel was written by Joe Seifi on December 29th, 2011 and categorized under Cydia Apps. Page viewed 11463 times, 2 so far today. Need help on using these apps? Please read the Help Page. I really need this app it’s been driving me crazy and I don’t know what to d to get it the app is barrel and I don’t know why I want it so bad but I really do so can I please get this app. I really need this app barrel I’m sick of boring normal swipe ???? I would to get this on my phone because i am always using my finger to move the page that is getting out. A the sad thing is i can’t upgrade.